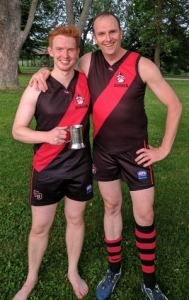 The Toronto Dingos and Toronto Eagles were finally able to play their long-postponed AFL Ontario round one clash this past Thursday. This and a number of other round one fixtures were originally postponed due to the rain soaked condition of several of the available fields earlier in the year after a particularly wet spring, but there were no such issues on Thursday afternoon at Humber College South. Coming in the Eagles sat second on the ladder, with their only loss thus far being to the undefeated Toronto Rebels back in round three. The Eagles got going right from the opening ball-up, with nine scoring shots in the first quarter resulting in a 4.5-20 to 0.2-2 lead at the end of the term with the Dingos struggling to maintain consistent possession. The Dingos found a way to stem the flow somewhat in the second quarter, scoring a goal and keeping the Eagles to one at the other end. The tally of nine behinds for the quarter to the Eagles was however indicative of the pressure Dingos fullback Tim Indian, well assisted by David Wells and Greg Gilbert in the half-back line, had to absorb. As a result despite the improved showing the Dingos went to the half time break down 5.12-42 to 1.3-9. After the frenetic pace of the first half things were more even in the third with the Dingos finding some renewed vigor with which to attack the game and the Eagles slowing somewhat. Steve Speers was again relentless in contests around the ground and Sean O’Reilly provided a great target in the half forward line when the Dingos got the ball moving in this quarter. Ultimately though the two teams ended the quarter having matched each other with one goal and two behinds apiece with the Dingos again rueing a slow start to the game that put them in a hole that would ultimately prove too deep to come back from. In the final term the Eagles ran away with this one, ultimately winning 11.21-87 to 2.6-18. Tim Indian was awarded best on ground for his relentless defence at fullback without which this game would have seen an even more lopsided scoreline. The Dingos will play the Eagles again in the penultimate round of the AFL Ontario regular season on August 19th. In the meantime though the Dingos must turn their attention to the Hamilton Wildcats. The two teams will meet in round ten action on Saturday August 12th at Mohawk Park in Hamilton. Ball-up is scheduled for 12 PM.